We know how important meal preparation can be to your family, and with The Spiral Spoon’s handcrafted wooden spoons, we hope to make your kitchen a little more fun, functional and beautiful. Each wooden spoon is uniquely handcrafted in the USA from one of more than 50 different kinds of wood, and they are designed to be used by anybody. 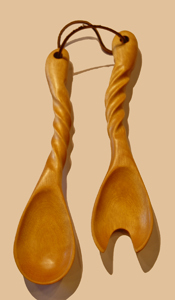 Whether you are cooking a complicated, five-star meal or making macaroni and cheese for the kids, our handcrafted wooden spoons can make a great addition to your kitchen. We believe in the art of craftsmanship, and we carefully sculpt each individual spoon by hand. 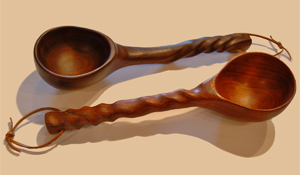 Even if two spoons were made from the same pattern and wood, they are all unique. 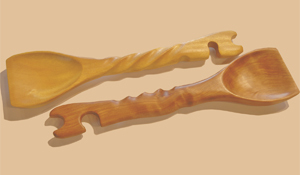 We offer a large variety of spoon designs, and most are available in right-handed, left-handed or ambidextrous options. In addition, we work with both foreign and domestic wood, including birch, cherry, maple, hickory, poduke, bloodwood and purple heart. 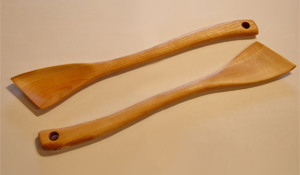 If you are considering a unique, beautiful gift for someone who loves spending time in the kitchen, consider one of our handmade wooden spoons. Contact us today or stop in and see what we have on hand at our store, located in the Glacier Park area of Montana.